Some of our guests climbed Ampersand over Columbus Weekend and shared this photo. 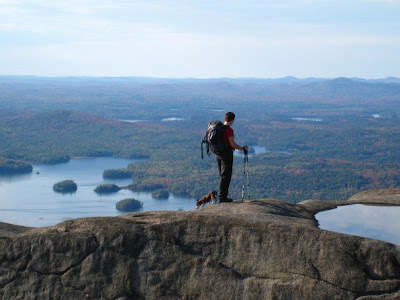 Ampersand boasts a 3,352 foot bald summit with incredible 360* views including many lakes as well as the High Peaks. The 5.6 mile round trip hike takes about four hours. The first part of the trail is a mile long flat stretch through the forest which is followed by a steep ascent to the top, including some hand over hand bits. Great views in all directions make this a popular hike. Grab some sandwiches from the Lakeview Deli (just minutes from Harbor Hill & Ampersand) and dine at the summit (leaving nothing behind of course!). Trust us - working up a little sweat hiking through the trees with your friends and family is a fond memory for many visitors and a true Adirondack vacation experience. The trail head is 8 miles West of Saranac Lake on NY-3.